Much attention is given to the quality of anti-corrosive plating, which helps us to reach within a few decades of experience. 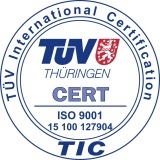 The international management system standard LST EN ISO 9001:2008. New generation technology is free from Cr6+ compounds and meets the requirements of RoHS Directive. We provide comprehensive logistics services - by costumers needs we can pack, mount and deliver costumers goods door to door at the right time. Congratulations on ordering our newsletter!